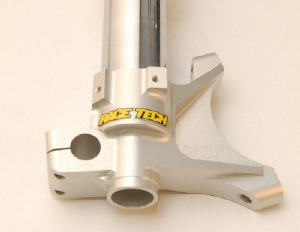 For Super Singles Road Racing we recommend the FBFR Series Fixed Offset Fork Bottoms. These do not change the offset but provide mounting for 108mm Radial Brake Calipers that are clearly stronger. We highly recommend modifying the stock forks instead of replacing them with Sport Bike forks, as they are a bit too short. The Left Fork Bottom can be purchased separately or as a complete pair. Question: As of now I have my bike set up for supermoto, you recommend new Fork Bottoms. Will the new fork lugs accept the existing brake system? Answer: Technically, but the braking forces generated in roadracing are substantially higher than those in supermoto. My concerns are safety and performance. Part of our mod is replacing the Fork Bottoms (a.k.a. Lugs, Holders, etc.) with some that have mounts for Radial Calipers. This is far stronger and more rigid than the standard mounts using adapters. If you currently have 108mm radial calipers they will bolt on directly. 108's are standard on Japanese sportbikes and there are many aftermarket options.